Like many films that are “based on a true story,” before the credits roll on TAG, archival footage plays. Granted, the footage is fairly recent, mostly caught in the cell phone era, but it nonetheless shows a group of older friends going to extreme lengths to play tag; dressing up in costumes, sneaking into showers, and elaborate chases are all par for the course in the group’s elaborate, long-running game. Never has archival footage done such heavy lifting, validating a goofy, even surreal, premise to something clearly plausible—even if the film is over-the-top, it doesn’t appear to be all that far off from the real-life group depicted on screen, and in its own way its charm elevates the movie and its increasingly obsessive focus on what is ostensibly a children’s game. Just like the game itself, and just like that archival footage, TAG is amusing, a series of elaborate and exaggerated action set pieces all developed around trying to touch another person. 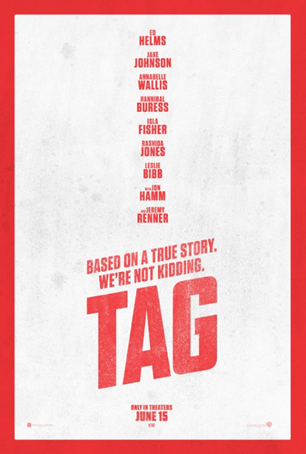 TAG’s premise is centered around a group of childhood friends setting their sights on tagging Jerry (Jeremy Renner), who in 30 years playing the game has never once been It. When Hoagie (Ed Helmes) catches wind of Jerry’s wedding on social media, he jumps at the chance to get the gang together to finally tag him, and a series of slo-mo chases and inner-monologue narrations ensue. Along the way we encounter some tiring and flimsy side plots, including a mostly undeveloped competitive flirt-off with Rashida Jones between Jon Hamm and Jake Johnson, and a Wall Street Journal reporter (Annabelle Wallis) whose presence following these characters is distractingly expositional. Both do more harm than good, frequently pulling characters out of the action when the whole film is built around a premise of bonding, and neither of which are actually resolved in any way by the end. And the winner for Best Visual Effects at the 91st Annual Academy Awards Goes to . 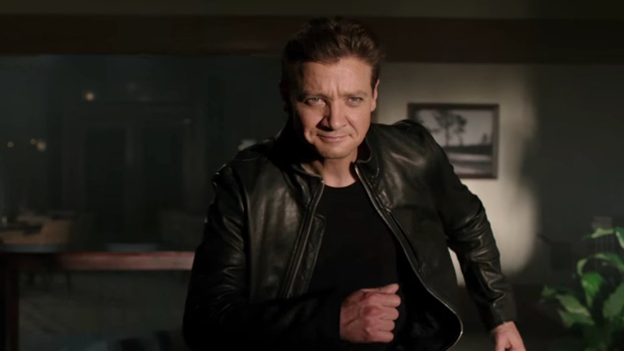 . . TAG, for recreating Jeremy Renner’s hunky arms! Like any game that lasts too long, you begin to nitpick the rules. What do the people whose lives are seemingly upended by this game (an AA Group, hospital attendees, a goddamn wedding) think of all of this? Frequently TAG elects to ignore much of its own destruction, especially when serious medical issues are teased as plays within the game. How can you trust anyone, especially your friends, when the obsession with not being It overtakes everything, including a sense of basic decency? These are questions the film briefly considers but mostly ignores. It’s be It or be tagged, a cut and dry premise that can’t be bothered with morality. TAG does have laughs, though. Generally the cast’s interactions play out exactly how you’d anticipate they would—for actors like Hannibal Buress or Helmes, it’s hard to see them doing anything other than their own shtick, but that self-aware questioning and nerdy, buffoonish anchoring works for both of them, respectively. Renner, CGI arms and all (seriously, watching the movie to figure out what was CGI and what was him just fighting through the pain of filming without a cast is worth the price of a ticket, it’s most of what I thought about the whole film), delights as the pseudo-villain, and his SHERLOCK HOLMES-esque breakdowns of how to get out of taggable situations deliver a chuckle every time. Like a good comedy should, TAG tosses its premise out to its talented cast and they (including MVP Isla Fisher) run with it and mostly deliver. But when the film hits a more serious climax, especially with its misguided sense of morals, the male bonding the film has been building stretches thin. A film that was constantly exploring why a game of tag has lasted 30 years would be more interesting than simply watching one unfold, and in those final minutes, it seems like the writers frustratingly know that, even if the previous 90 minutes ignored it.TAG, in spite of its likable nature, just misses the touch.